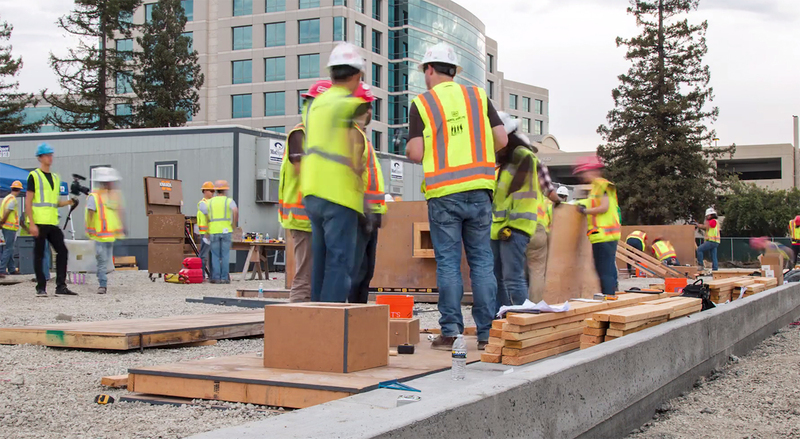 The Northern California District held its Fourth Annual Field Engineer Bootcamp from August 2-4, 2017, at the San Jose Skyport project. The 25 attendees were broken into five Looney Tunes-themed teams: Marvin Martian, Road Runner, Sylvester, Taz, and Yosemite Sam. Teams started in the classroom, learning about lift drawings, field documentation, and equipment before heading out into the field to safely lay out and install their wall formwork, reinforcing, blockout, and anchor bolts. All five teams worked hard and completed on time for their evening concrete placements. The final day saw teams stripping their formwork and admiring the final products. Every participant came with a willingness to learn and a desire to help their team perform. Additionally, participants experienced firsthand the hard work our craft performs in the field every day to make our projects successful.